Why do we need so many new houses? Wasn’t there a plan to build on Sandleford Park 15 years ago? Why is the Council so keen on building here instead of anywhere else? Are there any other places to build the houses? Isn’t it all a foregone conclusion? Sandleford Park is just to the south of Newbury, Berkshire, UK. To see a satellite photo in Google Maps, click here. It covers a huge area roughly speaking bordered by Monks Lane in the north, Wash Common in the west, Greenham Common in the east, and the HAmpshire border in the south. SANDLEFORD-PRIORY, an extra-parochial tract in Newbury district, Berks; on the river Enbourn, 2 miles S of Newbury. Real property, £775; of which £10 are in fisheries. Pop., 49. Houses, 9. An Augustinian priory was founded here in 1200, by Geoffrey, Earl of Perche; and was unexed, in 1480, to the Collegiate church of Windsor. A modern mansion, called Sandleford Priory, was the residence of Mrs. Montague, of literary celebrity; includes a dining-room, formed out of the chapel of the ancient priory; and is now the seat of Lord Rokeby. More and more people want to live in their own home in West Berkshire, for lots of different reasons. Some are the children of West Berkshire families who leave home and want a home of their own, on their own. Some people are moving into the area because they work here. People get married much later in life than used to be the case, and more and more couples separate, so there is more demand for homes from single people than ever before. People are living longer, and staying in their own homes for longer, where previous generations may have moved into a care home. All of these factors, and others, add up to the need for more housing in West Berkshire (and, indeed, in most other parts of the country, for the same reasons). Click here to see a map of the proposals (opens in new tab/window): the DARK BLUE areas are where the houses will go. The DARK GREEN areas show the ancient woodland that will be surrounded by houses. Before 1,500 new houses were approved on Newbury Racecourse. Before The Chase (next to the Racecourse) was approved and built in 2002. Before the hundreds of houses along Pinchington Lane was approved and built. And, by the way, the plans 15 years ago were not right up to Monks Lane. But that was then and this is now. Then, Greenham was half the size it is today. And decisions today need to be made based on the facts today, not the facts 15 years ago. A good question. We don't have the answer. But we are not being unrealistic, we know that houses have to be built in West Berkshire. However, if you look at the detail of alternative sites, the Sandleford option just doesn't make sense (except perhaps to those landowners who have a great deal to gain by it...). Each site has gone through a detailed Sustainability Appraisal - basically a checklist of various issues - and has been scored on each in order to carry out a supposedly objective assessment. We think the scoring of the Sandleford site is skewed, to put it mildly - we think the Council had already decided that Sandleford was the answer and then made the scores fit accordingly. We have yet to meet a Councillor who knows why the scoring system was changed after the initial 'beauty contest' in which Sandleford came out as the Ugly Sister - the planners just say they know best!! The key site scoring document is Appendix 8 to Appendix A, which is buried deep within the Council's revised SA/SEA (Sustainability Appraisal and Strategic Environmental Assessment - but I'm sure you already knew that!). We have revised this bit of the SA/SEA (often just called the SA for short) using the original scoring system, to present what we think is a much more objective assessment of the two major sites that the Council has looked at - and as you will see, Sandleford is a long way behind. It is really difficult to understand why West Berkshire Council is so firmly convinces that Sandleford is the only answer. Yes. For example, brownfield land in Newbury and surroundings, and other greenfield sites that are much more sustainable than Sandleford. Sadly, despite our best efforts and those of the many people who have supported us, the decision to go ahead has now been taken, so there is little that can be done to stop the development now. What was the public meeting about? 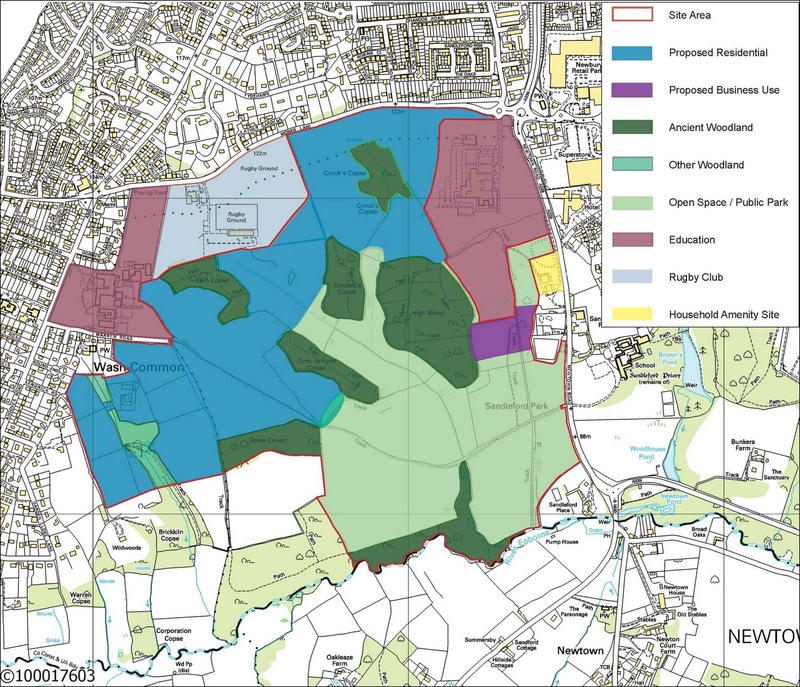 The meeting was organised by Newbury Town Council in December 2010 firstly to give the residents of Newbury the opportunity to hear the reasons why West Berkshire Council is so keen to build 2,000 houses on Sandleford Park and to ask questions of those who have made that decision. Secondly, the meeting was intended to provide guidance and assistance to residents who want to have their say. The consultation response process is very opaque and could easily have put people off, so it helped people to put their views in the correct way. the documents from the meeting are linked on the right. Press reports of the meeting are here. It's probably best to start with who wasn't at the meeting. Presentations were given by Cllr Anthony Pick (Con) in favour and Cllr Tony Vickers (Lib Dem) against. Representatives and residents from surrounding areas were there too. It wasn't - but sadly, despite our best efforts and those of the many people who have supported us, the decision to go ahead has now been taken, so there is little that can be done to stop the development now. All we can now do is focus on getting the best possible outcome for Newbury and its residents , both present and future.